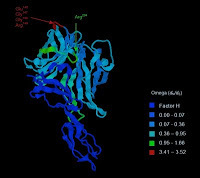 In Variation of the factor H-binding protein in Neisseria meningitidis, Carina Brehony in Martin Maiden's lab at Oxford investigated a group of outer membrane proteins in the bacterium responsible for meningococcal meningitis. To date, attempts to raise a vaccine against the common serogroup B meningococci have been frustrated by the low immunogenicity of the serogroup B capsular polysaccharide, despite success with serogroups A and C. Outer membrane proteins, such as factor H-binding protein (fHbp) may provide alternative targets for vaccine development. However, fHbp is genetically diverse, and our investigation showed evidence of structuring into three groups. OmegaMap analyses of the three groups revealed a signature consistent with strong selection pressure for antigenic variability at the gene. Notably, there was clear evidence of diversifying selection at several previously discovered epitopes - positions in the protein targeted by antibodies during bacteria-killing immune response. (Analysis of one group is shown in the figure, with known epitopes marked). While these observations are encouraging in terms of understanding the biology of pathogen antigens, a pressing question is how do we translate that understanding into practical vaccine design? Studies such as ours suggest a multi-component vaccine may be necessary to achieve broad coverage against serogroup B meningococci.